I took a trip to the dentist not too long ago. A two-hour drive one way with four kids, grandma, and Marty the dog. Yes, it was a bit much! By the time we got there, the kids had put stickers all over the back seats of the car and a quick glance showed my daughter with chicken nuggets in hand, concentrating heavily as she made art on her window, leaving a trail of white chunks behind..Gross! Since we moved, it was time to find a new dentist. It was hard to leave my old one, as with every passing year, I found myself looking forward to going to my annual check ups. For some strange reason, it felt like home and was such a comfortable and inviting place. It was also the dentist that Lydia had gone to. Nonetheless, the changing of the seasons had come and my resistance had to give in. Now I found myself in a new setting with new people. New beginnings make for uneasy feelings and a fear of the unknown. After the three kids went, it was my turn. In walked a beautiful tall young lady with dirty blonde hair much like my own. Taking a deep breath, formulating my response in my mind as she scrapes away at my teeth, I was so preoccupied I didn’t even notice the painful pokes in my gums. Yet, I knew IT was coming. The question that never fails when you meet someone new. Thoughts overtake me; should I lie and say I have four kids and not mention Lydia or tell her? The first did enter my mind as the easiest way out of this. My mind was bouncing all over the place, trying to find my answer before IT came. Well maybe she won’t ask, I thought. Right. Wishful thinking. My young daughter sat in the room with me. As I was laying in the dentist chair, the adorable, friendly hygienist, talked about her family, schooling and life in general. Soon after, my daughter walked to be by my side as if she was wanting to comfort me. She grabbed my hand and began stroking my hair, meticulously watching the hygienist’s every move, making sure her mom was okay. And there it came as I nervously anticipated, the elephant in the room, making a grand entrance, stomping loudly. Without fail, year after year, time after time, it comes. After six years of loss, I still cringe when I feel this question making its presence known. “Oh, I’m so sorry,” she said as she finished up and quickly left the room. Here she was, a new mother who could not even imagine or grasp what I had just told her. Why did I have to say this. I wonder, did she get it? Of course not. It probably went in one ear and out the other, as many cannot comprehend, nor want to imagine such a thing. I don’t blame them. I used to be one of them, not wanting to invite such a scenario. You know, the kind of person that hates to talk about death and upon hearing of someone losing a loved one, or a child for that matter, thinking how awful that would be and quickly change the subject. Yet I let my mind experience that nightmare just for a moment and then go on with my normal life. Sound familiar? Next, I sat silently waiting for the dentist to come in. My daughter climbed up into my lap, wrapped her arms around my neck and said, “I love you Mom.” Now overcome with gratitude and love, I knew I had been blessed as I wiped away my tears. To some, this may not seem like a big deal, but to us who have been there, it’s always a big deal. 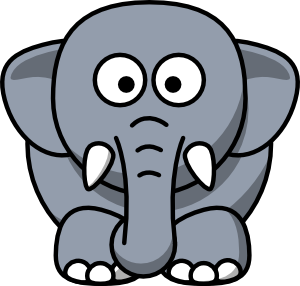 So what to do with that elephant in the room? Take him head on, befriend him, open your heart and make your loved one proud. Don’t be afraid to speak their name or make others uncomfortable, for your loved ones will always be a part of you. I pray often that others don’t experience this tragic loss and deep sorrow. However, if it does come your way, just remember, God gives us everything we need to survive the storm. Oh, I’m so unbelievably sorry for the loss of your son. What an amazing blog you have that keeps perspective in life, showcasing the joys, craziness, and moments that matter. I love it. It’s such an uncomfortable situation when we encounter those initial introductions. I guess it all depends on the situation and our mood! I’ve spent so much time looking out for others that I end up a mess on the inside. Either way, our children are with us always and that’s what matters! Blessings & hugs to you. Daphne, through your grief, you speak to many of us who have “elephants”. It might not be a loss if a child, but it is a loss of another kind that makes itself known. It’s hard to grab the elephant by the tusks because doing that acknowledges its existence. Thank you for witnessing to me and my elephant today. Well said Carol. It sure depends on the situation and whatever is the easiest way out! 🙂 But mostly we feel the best when we speak of our children, I agree. Regardless, we are connected forever and that will never change. Much love & blessings to you..
How sweet that your daughter realized that this was a difficult subject for you, and it appears she, even at her young age, knew the question was coming. Very intuitive. While I cannot begin to understand the pain you have, I can understand the difficulty in answering the questions. We have two granddaughters that were taken from their home by DHS/CPS, the parental rights terminated and when we tried to foster and adopt but DHS battled us all the way and we have lost both of them to the system and adoption by strangers. In a way we deal with the same conflict when people ask us how many grandchildren we have — do we include those lost to CPS, or do we only list those that remain in the family? A similar but different pain. I feel for the struggle you endure on a repeated basis. So sorry to hear about your granddaughters. You are right, a similar yet different pain that I could not imagine. After all these years,I’ve found that I must stay true to my heart. She will always be my daughter no matter what. Thanks so much for sharing. Thank you for sharing. So sorry for your loss. My son passed away just two weeks ago. It’s good to hear the stories of others. Oh,my heart aches for you and your family. There are no words. I am very sorry to hear about your son. Thank you for finding my blog. I hope some of my experiences and words will touch your heart and give you hope. You are very brave and your strength throughout this journey will amaze you. God is an incredible healer and comforter. For, me too, it really helped to hear the stories of others. You are not alone. Prayers for you for peace and healing.. I know a few people who have lost children. My question is how can I best address the elephant with them? One in particular is stuck in their grieving. Healthy grieving is quite important to me (both of my parents have died) and I would like to help if it is possible. Hi Debbie- So sorry for the loss of your parents. Grief of any kind is so hard. What a big heart you have for your friends. They are lucky to have such a caring person by their side. Losing a child is different and devastating to say the least. Getting stuck in this dark grief is so easy to do. I would encourage you to mention their child’s name anytime you can and please don’t worry about making them cry. I’m certain they want to talk about them, even just having someone say their name can warm the heart. So many times, people are afraid to mention the child for fear of upsetting the parents. This cannot be farther from the truth. We love it when people say our child’s name. Also, if you can get your friends to tell stories of their child, funny, sad, or anything in between those memories while some can be painful, are such a blessing to know that our child was here. The memories are priceless. What also helped me was connecting with others who had lost a child. Sharing in this is an almost sacred thing and really helps to find someone who understands. In addition, depending upon how long ago their loss was, possibly helping them find a way to remember or honor their child, by celebrating their life in some way. Whether it’s their favorite foods, going to a favorite place, donating items in memory, making a memory quilt, etc. There are so many ways to do this. My most read post from this year was “My 10 Secrets to Survival After Losing a Child” If you haven’t read this, I would recommend a quick read. For sure, this was the key to my survival. I would love for you to point your friends in my direction and would like to help in any way I can. Hope this is helpful. Blessings to you!